Getting enough fiber in your diet every day is essential to maintain good health but is especially important if you want to lose weight. Obesity rates are at an all-time high in America, partly due to a lack of fiber. The typical American only gets 7-15 grams of fiber a day, but The American Heart Association recommends getting 25-30 grams to maintain health. To support weight loss efforts, experts recommend upward of 30-50 grams of fiber a day. So, what makes fiber so helpful for weight loss? When it comes to losing weight, fiber is like magic. Though it is a complex carbohydrate, humans lack the necessary enzyme needed to digest fiber. That is partly what makes it so helpful for weight loss. Fiber moves through the digestive tract acting as a brush that sweeps out debris, toxins, waste. The liver sends toxins to the digestive tract for final removal, so without enough fiber to sweep toxins out of the digestive tract, weight loss will inevitably come to a halt as your body tries to protect your vital organs. Since humans can’t digest fiber, it primarily adds bulk. Fiber helps fill you up without adding extra calories. Plus, fiber slows the rate that food is digested which keeps you feeling satiated longer and minimizes blood sugar spikes that can result in cravings for sweets and junk food later. This is useful to help you go 5-6 hours between meals and resist the urge to snack per The Five Rules of Leptin Diet. Fiber is more than just roughage. It also acts as a prebiotic, or a source of food for the good bacteria in your digestive tract. When beneficial flora eat the fiber, they produce a short-chain fatty acid called butyric acid. The butyric acid causes immune cells to release anti-inflammatory compounds in the digestive tract. Ensuring you get enough dietary fiber helps to ensure you have a healthy microbiome, which has been connected to a healthy metabolism, hormonal balance, immune system, lower inflammation. There are two types of fiber: soluble and insoluble. Soluble fiber absorbs water and forms a gel. In the digestive tract, that gel helps prevent constipation, clear toxins, and lower cholesterol. You can get more soluble fiber into your diet by eating more legumes, oat bran, and a variety of fruits. Insoluble fiber does not mix with water and primarily adds bulk and acts as a brush to sweep your digestive tract clean. 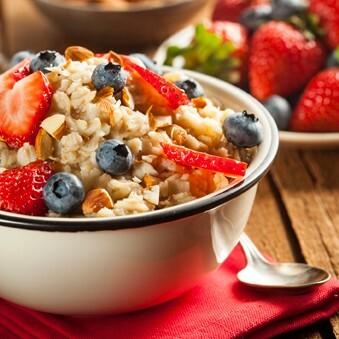 Getting enough insoluble fiber is especially important for supporting regular bowel movements and cleaning out toxins. Whole grains, beans, vegetables, and the skins of certain fruits are the primary sources of insoluble fiber. As a general rule, you need both types of fiber as part of a balanced diet that includes plenty of fresh fruits, vegetables, legumes, and whole grains to support healthy weight management. It can be a challenge to get enough fiber from your diet to support healthy weight loss. During a reduced calorie diet, it would be common for dieters to have two servings of fruit a day and two servings of vegetables per day. Since a serving of fruit or vegetables usually equates to about 4 grams of fiber, that adds up to about 16 grams of fiber total for the day. That’s just half of the necessary 30-50 grams recommended to support weight loss! An easy way to boost your fiber intake, support gut health, reduce appetite, and enhance detoxification is to use a high-quality fiber supplement. Be wary of products that contain excess sweeteners to make them palatable, gum up too much in water and are hard to swallow, or make excessive gas when consumed. Oat beta-glucan, psyllium, and arabinogalactan are excellent, high-quality fibers to supplement. Add fiber powder to your breakfast smoothie or mix with water. These types of fiber dissolve easily and have very little flavor. Fiber forms the foundation of healthy weight loss. Getting the recommended 30-50 grams of fiber will help you follow The Five Rules of the Leptin Diet without feeling deprived and make you much more likely to reach your goal weight. Give it a try!